Ian McKellen’s performance was outstanding... 5 Star in every respect. Unfortunately I struggled with the rest of this more modern day adaptation of Shakespeare’s magnificent play. 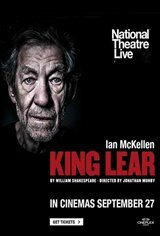 I’ve seen King Lear a couple of times and loved those performances. But taken out its normal medieval time frame, I had a hard time following some of the characters and the modern day scenarios that surrounded their actions and maybe more importantly, their dialogue. Went to this performance hoping to love it, but came away disappointed. 2 1/2 Stars.